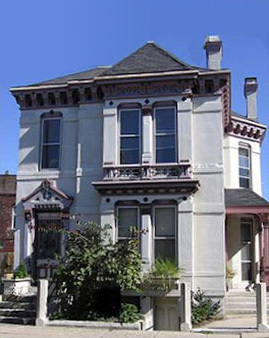 Inn Port D’Vino is a historic guesthouse, located at 22 Brown St in the heart of the Oregon District. We offer lodging options with free wi-fi and flexible continental breakfast that are within walking distance to Downtown Dayton, the Convention Center, Fifth Third Field, and Riverscape. Inn Port is also just a short drive away from the U.S. Airforce Museum, the Dayton Art Institute and the University of Dayton. Inn Port can accommodate solo travelers, couples, or groups of up to 16. Whether you are traveling for business, family, romance or relaxation, we provide a unique alternative to staying in a hotel, with comfortable accommodation and warm hospitality, guaranteed. Make it a “Bed and Vino” experience with a visit to our onsite wine bar and retail shop, Deaf Monty’s Wine. Jeff and Leslie Gonya lived in the quiet, residential Dayton neighborhood of Patterson Park for 5 years. They loved to travel, and when they did, they always looked for a bed and breakfast or inn rather than a hotel to fill their need for lodging. From this came their dream to open a bed and breakfast, someday.